...a Severe Thunderstorm Warning Remains In Effect Until 730 Pm Cdt For Northwestern Midland County... At 704 Pm Cdt, A Severe Thunderstorm Was Located Near Greenwood, Moving Northeast At 40 Mph. Hazard...golf Ball Size Hail And 70 Mph Wind Gusts. Source...radar Indicated. ...Read More. ...a Severe Thunderstorm Warning Remains In Effect Until 715 Pm Cdt For Northeastern Coke And Southwestern Nolan Counties... At 654 Pm Cdt, A Severe Thunderstorm Was Located Near Maryneal, Or 12 Miles Northwest Of Blackwell, Moving East At 30 Mph. Hazard...golf Ball Size Hail And 60 Mph Wind Gusts. Source...radar Indicated. ...Read More. ...a Severe Thunderstorm Warning Remains In Effect Until 715 Pm Cdt For Southwestern Midland County... At 632 Pm Cdt, A Severe Thunderstorm Was Located 9 Miles South Of Midland, Moving Northeast At 40 Mph. Hazard...70 Mph Wind Gusts And Ping Pong Ball Size Hail. Source...radar Indicated. ...Read More. GRAPELAND – In their second performance of the day, Doris Stevenson on the piano and Marcus Stevenson on the viola showcased their classical music talents as they brought their musical stylings to the Lorena Schultz Auditorium on Tuesday afternoon as part of the Piney Woods Fine Arts Association (PWFAA) “Arts in Education” series of events. Stevenson and Thompson are part of what is known as the Piatigorsky Foundation which is “… dedicated to making live classical music an integral part of everyday life for communities throughout the United States. Gregor Piatigorsky, the renowned Russian cellist for whom the organization is named, believed that music is not a luxury for an elite few, but a necessity of life for all,” the Piatigorsky Foundation website stated. The foundation was started by Piatigorsky’s grandson, cellist Evan Drachman, in 1990 as a way to honor his grandfather and since that time the foundation, “… has presented more than 3,775 performances, introducing the joy of live classical music in communities throughout the country. Our artists play for audiences including seniors, schoolchildren, the economically disadvantaged, and those living in geographically remote areas,” the website stated. 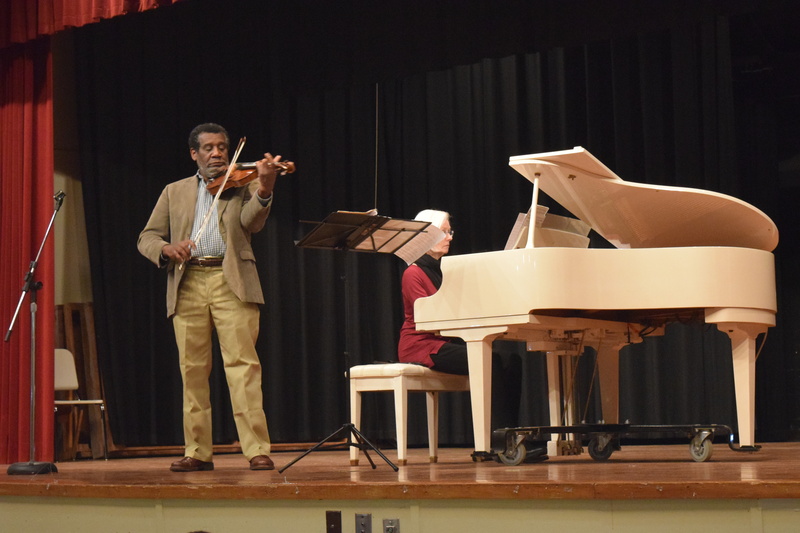 After a morning show in Kennard, the pianist and violist player traveled to Grapeland to perform for Grapeland elementary and junior high students. Prior to taking the stage, Stevenson and Thompson took time to discuss what led them to the Foundation and how they got involved with music. “I’ve been with the Piatigorsky Foundation since they started so I guess that’s 20 some odd years,” Stevenson said. “It’s been about four years since I joined,” Thompson said. Asked what led them to join the Foundation, Stevenson said she had the good fortune to play with Piatigorsky. “I know the Piatigorsky family and his grandson started this foundation to bring classical music to rural areas,” the pianist said. Shaped like an oversized violin, Stevenson said the difference between the viola and the violin is the size. “The bigger instrument has a lower tone that is much richer. I’ll play all registers of the music, however, so you may not notice that much difference,” he said. Stevenson was also asked how what led her to the piano. “I guess my mother started me on the piano because she played a little bit. I was really little and I liked it enough where I stuck with it,” she explained.